This essay won the 1993 Dr. Edward Shaw award in the “Young Historians” competition. It was written by Brock Arnason, then a grade 11 student at St. John’s-Ravenscourt. Icelandic settlement in Canada has had a long and detailed history, its roots dating to the arrival of Leif Eriksson in North America in the tenth century. Since Eriksson’s time there has been a tremendous emigration from Iceland to Canada. The Riverton area near Gimli, Manitoba in particular has been the site of numerous settlements. The history of Icelandic settlement in the Riverton area is a firm basis upon which can be built an understanding of the strong cultural identity of modem Gimli. Though Icelanders knew of the existence of Canada since its discovery in the tenth century, there was no large-scale immigration until the late nineteenth century. At that time, the conditions in Iceland were so terrible that literally thousands of Icelanders left their homes and often their families to start a new life in Canada. The great majority of these immigrants settled in Manitoba, in the area north of Boundary Creek (Winnipeg Beach) and extending as far north as Hecla Island. The Gimli and Riverton districts were the focus for most of this immigration. The immigration reached its peak after the winter of 1875. To understand the conditions in Iceland at that time, it is necessary to briefly review the country’s history. Iceland was colonized by Viking warriors soon after its “discovery” in 860 AD. Hrafna-Floki, one of the three Norse Vikings credited with the discovery of this new land, christened it Island. The literal translation of this is Iceland, or land of ice. However, Iceland was not merely a land of ice. There were a large number of active volcanoes on Iceland, many of which periodically erupted, causing a great deal of consternation to the Norse settlers. For several hundred years Iceland was ruled by a democratic body calling the Althing, whose members were chieftains and other important persons. Unfortunately, in 1262 Norse rule was imposed. Conditions in Iceland rapidly deteriorated. In 1380, the Danish seized control of Iceland, disbanding the Althing, and imposing their religious beliefs on Icelanders. Under their rule, a ruinous trade monopoly was imposed in 1602, squelching all economic initiative. At the time that the Althing was restored to power, there had just been a series of bad winters. Farmers, finding it difficult to survive as it was, were now on the verge of starvation after several bad crops. The welfare laws at the time decreed that any man who wished to go on welfare had to return to the region of his birth. There, a local council would be responsible for finding ways to feed and clothe the man and his family. In order to do this, families were almost always broken up and sent to live on different homesteads. Children were often abused and forced to work to death, sentenced to this fate by heartless councilmen. The following testimony from a farmer of that period corroborates these statements. At the beginning of 1875, matters came to a head. On 3 January, a bright orange glow and a tremendous pillar of black smoke was sighted inland from a number of coastal Icelandic villages. Mount Askja, a large active volcano, had erupted, spewing millions of tons of debris into the air. Over the next few weeks, dozens of eruptions occurred, filling the sky with smoke. Finally, on the second day of Easter, Mount Askja erupted with tremendous force. The lethal smoke and ash filled the air and rained down upon Icelandic settlements across all of Iceland. For most people, this was the last straw. With the ash from the eruptions, it would be all but impossible to harvest any crop at all. Conditions in Iceland were now so poor that any place at all would surely be better. Icelanders were quite prepared to pack their bags and leave. The only question was ... where would they go? Wanting to start a completely new life in a new land, the obvious choice for a location was North America. But where in North America? Sigtryggur Jonasson had the answer. One of the first Icelandic immigrants to Canada, Jonasson had moved to Canada in 1872. Hearing about the disastrous conditions in Iceland, Jonasson returned to Iceland to try and convince Icelanders to emigrate to Canada. 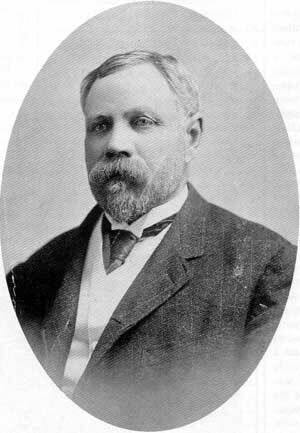 Because of his diligence in this undertaking, he became known as the “Father of New Iceland.”  He distributed a booklet on behalf of the Canadian government called Nýja Ísland I Kanada (New Iceland In Canada), which proclaimed the numerous benefits of starting a new life in Canada. Jonasson himself was part of an expedition to the north of Manitoba (Manitoba at that time was still the “postage-stamp” province) to locate a site to establish New Iceland. Sigtryggur Jonasson, father of New Iceland Colony. In the selection of a site for New Iceland, the Manitoban expedition had many factors to consider. First of all, the Icelanders wanted New Iceland to be very similar to Iceland but without its drawbacks. They wanted it to have good soil and farm land, and easy access to a lake. This way, those who were farmers and fisherman in Iceland would be able to apply their skills in New Iceland. Also, the Icelanders wanted a site isolated from the rest of Manitoba, so that they could live by themselves in peace. The final requirement for New Iceland was that it must be free from natural disasters. The expedition eventually decided that a site approximately eighteen miles upstream from the mouth of Icelandic River was the perfect location for New Iceland. The only drawback they could find was an abundance of grasshoppers. Now that a site had been selected, the only remaining problem was transportation. Icelanders who wanted to emigrate had to sell all their land and possessions (which usually consisted of several sheep and a small house), and take only that baggage which they could carry with them to the nearest sea port. Due to the large number of would-be immigrants, most had a tough time finding people willing to buy their meagre possessions. Tickets for boats were expensive, costing as much as fourteen dollars apiece. Many parents could not afford to send both their children and themselves. Consequently, it was not unusual for children to make the voyage to Canada alone, starting a new life without their families. Despite the cost of the tickets, they were in great demand. The voyage itself was dangerous, in that living conditions aboard the ships were far from sanitary. Ships such as the Queen, which carried 165 immigrants, were originally designed for transporting horses. Many Icelanders died on the voyage from various communicable diseases. However, those that arrived in Canada were tough, hard-working individuals, who were willing to start over in a new land. New Iceland pioneers posing in front of their log cabin in the Gimli area, no date. Upon their arrival in Canada in 1875, the group of Icelanders were given the opportunity to choose where to go. A small number joined friends and relatives in Wisconsin, Minnesota, Nebraska, and Nova Scotia. 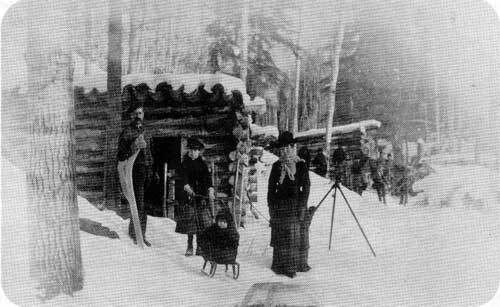 The large majority moved on to Kinmount, Ontario, where facilities had been erected for their habitation. However, there was a scarcity of stoves and hovels, and to retain what meagre trappings they possessed, the immigrants were forced to work long, hard hours for low wages. In the few months they stayed at Kinmount, almost all children under the age of two and a large number of elder citizens died. Luckily, John Taylor, a missionary, and Lord Dufferin, the governor-general, provided for the transportation of the Icelanders to New Iceland, north of Manitoba. Anxious to make a fresh start in New Iceland, the Icelanders were only too happy to abandon their residence in Kinmount, and set off for Manitoba. 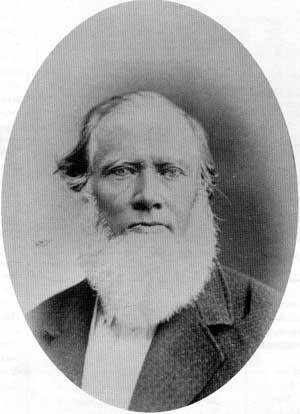 John Taylor, missionary and Canadian agent for the New Iceland Colony, no date. The Hudson’s Bay Company steamer Colvile was used to tow a large number of flat boats, each measuring only thirty-six feet in length by sixteen feet in width, which the Icelanders occupied. The steamer set off from the Red River in Winnipeg, travelling up into Lake Winnipeg. The trip went smoothly until they reached the lake itself. At this point, bad weather and fear of the lake freezing over prompted the captain of the Colville to cut the flatboats loose and return to Winnipeg. Thus, at 4:30 P.M. on 21 October, the boats were blown ashore at Willow Point (on what is now Willow Island, a privately owned beach), over twenty-four miles from their intended destination. There was no going back at this point; they had to try to make the best of a difficult situation and survive the approaching winter. On their voyage to New Iceland, the Icelanders had decided on the name of “Gimli” (which is Icelandic for “paradise”) for their first town in the new land. Ironically, life in Gimli was far from idyllic. The Icelanders were not at all prepared for the harsh Canadian winter. They came without cows and with very few livestock, and thus their diet was very limited. What shelter they had, consisting primarily of a few old tents, was scarce. These factors, combined with the violent winter winds blowing off Lake Winnipeg, resulted in thirty-five deaths from scurvy and exposure. The only thing that allowed the colony to survive the winter was a loan of 5000 dollars from the Dominion Government. This loan allowed the Icelanders to buy shelter and decent food supplies which lasted them through the winter. Despite the severity of their situation, the Icelanders continued the development of their “colony” throughout the winter. Only nine days after the landing at Willow Point, the colony dispatched a messenger to the government of Manitoba, asking for permission to immediately establish a school. Without waiting for a response, the colony began enroling students. The importance placed on education may seem surprising for a new colony. However, Icelandic culture placed a very high value on education and knowledge, and the Icelanders brought their cultural mores with them to Canada. The school, which taught reading and writing in English (Icelandic was, by tradition, taught in the home), started as a small one-room shack. After the arrival of the Stóri Hópurinn, however, it soon expanded. In the latter part of 1876, the Icelanders experienced a crisis of tremendous proportions. With the arrival of the “Large Group” came increased contact with the outside world. This contact had its good sideincreased trade and commercebut it had its risks as well. Smallpox, one of the most lethal diseases of the time, was brought to New Iceland. It swept through the entire settlement, devastating everyone and everything it contacted. Often men and boys would come home after working as hired farm laborers to find their families dying or dead from the disease. Eggert Johannsson of Vindheimar, who was a young man of eighteen when the epidemic hit New Iceland, told the story of a young boy returning home to his family. News of the smallpox epidemic spread more rapidly than the disease itself. Fearful that the disease would spread to Manitoba, the Lieutenant-Governor of the province placed a quarantine on New Iceland on 27 November 1876. Despite all quarantine measures, the disease continued to spread. Those adult Icelanders that were vaccinated from the disease were relatively unharmed. However, children and adults who were not vaccinated usually died after contracting the disease. From their contact with the Swampy Crees, the Icelanders spread the disease. Not being vaccinated at all, the Native people quickly succumbed to the smallpox, and entire tribes were killed off. Many tried to flee from the disease and seek refuge elsewhere, but this only served to transmit the disease to others along the Icelandic River. J. S. Lynch, the doctor who was dispatched by the Manitoban government to treat the Natives suffering from smallpox, described their condition. After the hardships and misery brought by the smallpox epidemic, the general mood of the colony was one of despair. To prevent the breakup of the colony, the Icelanders needed a strong leadership. Thus, in 1877 the colonists began to devise a constitution which was finalized in 1878. This constitution “provided that the whole region comprising the colony of New Iceland be called Vatnsthing (Lake Region) and that it be divided into four districts: Vidinesbygd (Willow Point communitynow the Gimli district), Arnesbygd (The Arnes community); Fljotsbygd (the Icelandic River communitynow the Riverton district); and Mikleyjarbygd (the Big Island Communitynow Hecla Island. ).”  The government was closely modeled on the Althing in Iceland. A five-person council, composed of a reeve, an assistant reeve, and three council members, governed each of the four districts. The reeves from each of the districts would meet to form the grand council, which governed over matters concerning the colony as a whole. Under this constitution, New Iceland was recognized as a separate nation with full jurisdiction concerning immigration, taxation, and legal matters. 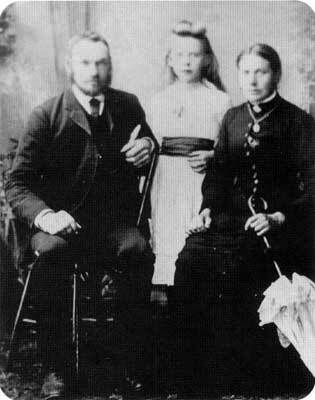 Stefan Benediktsson and family, Icelandic pioneers in the Riverton area, 1893. Despite the efforts of the government of New Iceland to unite the populace, there was widespread emigration. Hearing of better lands in the south, hundreds of Icelanders voyaged to Winnipeg and as far south as Dakota to settle. Expanding, many also relocated farther north along the Icelandic River area, opening up the Arnes and Riverton districts. The result was that Gimli and most of the New Iceland area was abandoned. In 1881, after this so-called “exodus,” the population of New Iceland scarcely exceeded 100 people. New Iceland’s government, along with the local newspaper Framfari, disbanded. It truly seemed that the dream of a new, better Iceland was finished. Jonas Jonasson, editor of Framfari, the first Icelandic newspaper, with family, 1890. However, all was not lost. Within a few years of the exodus, the revival of New Iceland was already underway. The growing fishing and freighting industries near Lake Winnipeg offered many opportunities for employment. Those farmers who elected to stay in New Iceland learned the proper techniques for the cultivation of crops. They were prepared for any disasters which might befall them, and were confident in their abilities. A logging and lumbering operation was active at the Icelandic River from 1881-85, attracting many Icelanders. With the economy starting to emerge from its deep slump, many new immigrants from Iceland settled in the Icelandic River area. New settlements were created, and the towns of Riverton and Arborg (Icelandic for “river town”) were founded. This slow but steady stream of immigrants to New Iceland continued for over a decade, and by 1893 New Iceland was almost back to its former strength. The expansion and development of New Iceland, in particular the Gimli area, continued at a rapid pace throughout the next few years. In 1881, Manitoba expanded from the “postage-stamp” size, to encompass all of New Iceland. New Iceland however, remained a separate nation within the Canadian state. Many people in New Iceland believed that they would benefit greatly by a complete union with Manitoba. Thus, in 1887, all of New Iceland was incorporated into Manitoba as the Gimli Municipality. As a part of Canada, the colony of New Iceland prospered. Two entrepreneurial brothers, Stefan and Johannes Sigurdson, opened a number of fishing businesses, and in 1897 constructed the Icelandic steam boat “Lady of the Lake.” In 1899, Hans Petur Tergesen established Tergesen’s Store, a large general store which sold goods to Icelandic farmers. His store, run by his descendants, can still be found in Gimli today. In over one hundred years of existence, the Gimli Municipality has not substantially changed. 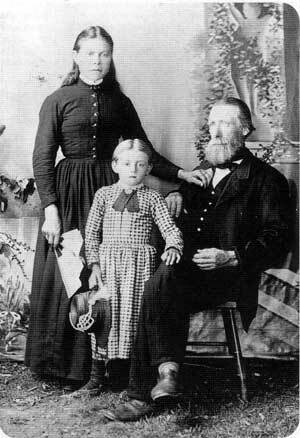 Ever since the exodus of 1881, there has been a slow but steady stream of Icelandic immigrants to Gimli. The permanent population has remained constant at a little over 2000 people. In recent years, large numbers of Ukrainian and Native settlers have ended Gimli’s unicultural identity. New Iceland has evolved into a fusion of several distinct cultures and peoples, contributing to, and remaining an essential part of, the multicultural entity that is Canada today. While Gimli is no longer the sole province of Icelanders, the Icelandic culture and character have had a major impact on the development of Manitoba. Their strong commitment to learning and education and the perseverance which is so important to Icelandic culture led many Icelandic settlers and their descendants to quickly and comprehensively integrate into the cultural mosaic of Manitoba. This adaptability has allowed the Icelanders to contribute significantly to the development of medicine, law, education, and literature in their new home. A view of Gimli in 1910. 1. Jo We., Iceland, Encyclopaedia Britannia, 1988 ed. 2. Gimli Women’s Institute, Gimli Saga, Gimli: 1975, p. 8. 3. Nelson S. Gerrard, Icelandic River Saga, Gimli, 1975, p. 13. 6. Gimli Women’s Institute, Gimli Saga, Gimli, 1975, p. 9. 8. Nelson S. Gerrard, Icelandic River Saga, Arborg, 1985, p. 23. 9. Walter J. Lindal, The Icelanders in Canada, Winnipeg, 1967, p. 18. 10. Gimli Women’s Institute, Gimli Saga, Gimli, 1975, p. 9. 12. Sigrid Johnson, The Icelandic Settlements in the Interlake Area 1875-1920, diss., 1971, p. 19. 14. Gimli Women’s Institute, Gimli Saga, Gimli, 1975, p. 30. 15. Sigrid Johnson, The Icelandic Settlements in the Interlake Area 1875-1920, diss., 1971, p. 19. 16. Nelson S. Gerrard, Icelandic River Saga, Arborg, 1985, p. 28. 17. Icelandic National League of North America, Gimli Chapter, Framfari, Altona, 1986, p.132. 18. Nelson S. Gerrard, Icelandic River Saga, Arborg, 1985, p. 36. 21. Elva Simundsson, Icelandic Settlers in America, Winnipeg, 1981, p. 156. 22. Gimli Women’s Institute, Gimli Saga, Gimli, 1975, p. 21. 24. Nelson S. Gerrard, Icelandic River Saga, Arborg,1985, p. 47. 26. Gimli Women’s Institute, Gimli Saga, Gimli, 1975, p. 38.